Plant: Extremely hoary, compact glaucous blue-green cushions. Brown inside. Stems 2.0-3.0 cm tall. Leaf: Dry leaves are loosely appressed to somewhat contorted. Moist leaf and stem make an angle of less than 25 degrees (erectopatent). Lanceolate, 0.5-1.0 x 0.3-0.4 mm, and keeled. Awn 2.0-4.0 long, smooth, flattened at base, and decurrent. Both margins narrowly recurved; however, once detached from the stem and placed under a coverslip the margins appear plain. Costa ends before apex, is weak, and projects on abaxial side (keeled). Leaf Cells: Basal laminal cells near costa are rectangular, straight to little sinuose, and thick-walled. Basal laminal cells near margin are quadrate and thick-walled transversely. Median laminal cells are short-rectangular, little sinuose, and thick-walled. X-S: distal laminal and marginal cells are 1-layered. Costa X-S: smooth or angled (keeled) in outline. Stem X-S: Central strand absent. The blue-green color when wet, cushions that crack into polygonal patterns when dry, extremely long awns, and the occurrence on vertical or rocky under hangings are distinct. It can be confused with G. funalis which is also found in hoary compact cushions, is glaucous-green in the upper portions, and brown within. However G. funalis has been separated as a distinct species and grows in Ontario, Canada, Louisiana and Michigan, USA, and in Eurasia. G. brittoniae is more closely related to G. orbicularis. 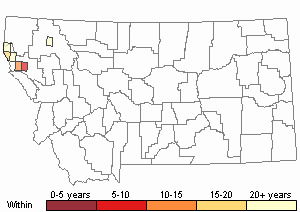 Endemic to northwestern Montana (Greven and Spribille 1999; Williams 1900) and immediately adjoining Idaho (Williams 1900). 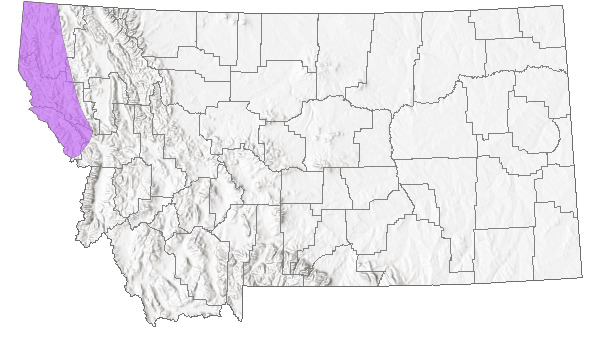 In Montana: Flathead, Lincoln, and Sanders Counties (Elliott 2016). Vertical faces of shaded, calcareous cliffs. Moderate elevations (1,640 – 2,300 feet). It grows in warm, dry but climatically moist valley bottoms or piedmont forests dominated by Douglas-fir. Dioicous. Seta is 2.0 mm tall, wavy, and symmetrically attached to base of capsule. Capsules are occasionally found, exserted, brown, ovoid, and wide-mouthed. Road widening may threaten at least one population. Greven, H., and T. Spribille. 1999. Grimmia brittoniae, a rare moss endemic to northwestern Montana. The Bryologist 102(1): 116-118. Williams, R.S. 1900. 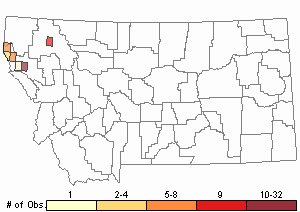 Two new species of Grimmia from Montana. Bulletin of the Torrey Botanical Club 27:316-319. Flora of North America Editorial Committee, eds. 2007. Flora of North America North of Mexico. Volume 27. Bryophytes: Mosses, Part 1. Oxford University Press, Inc., NY. xxi + 713 pp. 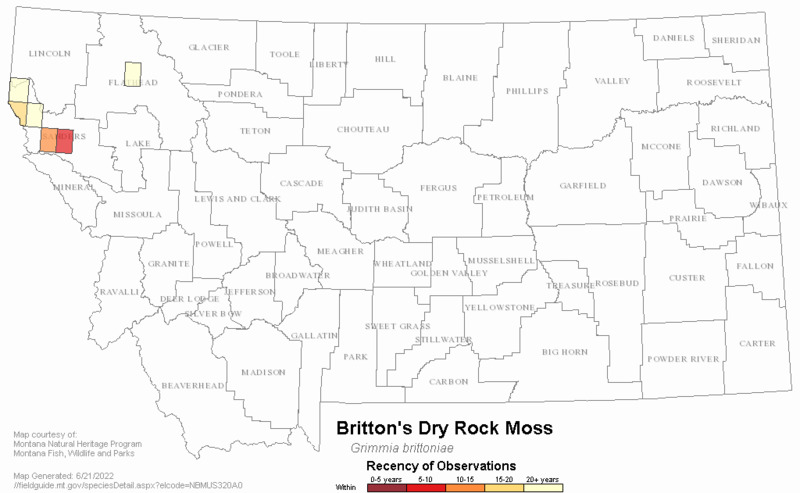 Web Search Engines for Articles on "Britton's Dry Rock Moss"